Here at Valente Law, we value our clients and we’re passionate about making sure that we’re doing everything we can to pursue justice and fairness for themselves, their families, and their businesses. Our Chicago clients receive the same treatment that we would give to members of our own family. That’s how much Charles Valente and his team care about the Chicago community and that’s not changing any time soon. Whether we’re assisting clients with their estate planning, we’re walking them through the idea of wealth management, we’re helping them figure out a real estate dispute, or we’re assisting with a business dispute, Valente Law is always working to ensure the financial health and well-being of our clients. Are you looking for a brilliant Chicago attorney who has decades of experience and a track record of excellence, professionalism, and integrity? Contact Charles Valente at Valente Law today to learn more or to schedule a consultation. 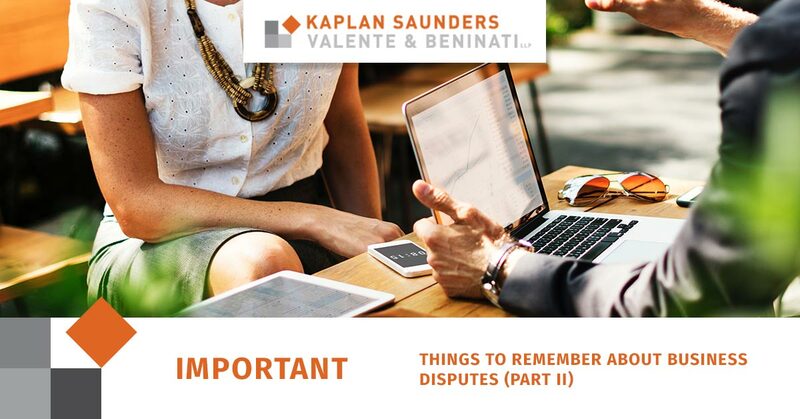 In part one of our blog series, we discussed the importance of having a great attorney on your side when you’re dealing with a dispute at your Chicago business. Because these disputes tend to take on all kinds of forms, it’s vital to have a legal team on your side who is experienced in all kinds of law and all kinds of business disputes. We learned that some of the most common business disputes involve a competitor, while others can involve customers, current employees, and former employees. No matter what kind of business you’re in, disputes and conflicts are, unfortunately, something that you’ll have to always be prepared to face. In today’s blog, we’ll learn about a few more common business disputes that many Chicago companies have had to deal with. We’ll also talk about important steps to take when, and even before you’re confronted with a business dispute of any kind. Continue reading to learn more valuable advice regarding disputes with your Chicago company. When there is a dispute between businesses that don’t sell the same products or offer the same services, it’s often due to a breach of contract or a failure to perform certain services promised and paid for. Since every company has to work in conjunction with other companies that provide other services like office supplies, trash service, food service, contracting, and so much more, it’s vital to know the right way to deal with business disputes of this nature. When your Chicago business encounters a dispute with another company, it’s vital that you seek experienced legal aid. Our goal at Valente Law is to get you past your dispute as quickly, efficiently, and profitably as possible. Reach out to us to learn more! Though this isn’t a common reason to experience a business dispute, there are times that the city lodges a complaint against your Chicago company and you must figure out a way to navigate that. These conflicts can look like anything from failed procedures or an accusation of a violation. When you know that the city is bringing a dispute to your business, don’t waste any time — reach out to Charles Valente today so that you can have the peace of mind and confidence that comes with being represented by the finest legal mind in the area. There are all kinds of reasons to encounter a business dispute here in Chicago. The important thing is that business owners are always prepared and know the right legal team to reach out to when those conflicts do arise. Let’s discuss some important steps to take when any kind of a dispute is brought against your company or business. When you’re confronted with a conflict, claim, or dispute, even if the dispute is groundless, it’s normal to feel nervous, afraid, and tense due to the nature of the situation. You’re probably worried about your business’ finances, reputation, or general ability to recover. The worst thing that you can do is panic or act rashly, this could create a much bigger problem than what you were originally looking at. Instead of responding to any dispute out of emotion and a defensive attitude, avoiding saying anything or giving any comment or response at all. Let your legal team do the talking for you. When you are confronted with a conflict is brought to you by a competitor, a vendor, a former employee, a current employee, another business, or anyone else, make sure that you don’t try to negotiate everything on your own, without the legal advice of an experienced expert. When business owners try and take matters into their own hands, there is great potential for making a costly mistake that could end up costing them thousands of dollars. When you’re presented with a dispute of any nature, make sure that you seek legal aid as soon as possible. When any kind of conflict or dispute comes your way, don’t waste any time; reach out to the best legal team in Chicago. We’d love to help you navigate your business dispute so that you can get back to business as usual. We have decades of experience in business disputes and we can bring our experience and expertise to your case. We hope that you’ve enjoyed your time with us as we talk the ins and outs of business disputes here in Chicago. Don’t forget to check out our site to read a little about our story, learn about our services, and to contact us to schedule a consultation. We’ll do everything we can to see if we can help with your case!